Do you use Skype™ (or Skype Tx™) for professional meetings, interviews or in any situation where it’s important that you look good? How you appear on-camera during Skype calls has considerable effect on your perceived professionalism and credibility. Let’s look at an example where Dave is being interviewed as a subject-matter expert. 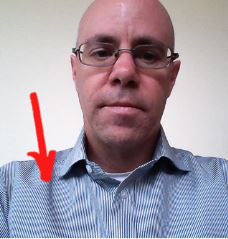 Look at this Skype image and form an opinion about Dave’s credibility. Most of the tips below take only a small amount of your time and have little to no associated cost. Implement one or all of them to make the most of your Skype calls and ensure your message is clearly the focus of the conversation. Make sure the background you choose is uncluttered, and in particular make sure it doesn’t have any distracting moving objects (like plant leaves moving due to breezes or air conditioners), messy appearance or lines that intersect with your head. In addition to being less distracting, plain backgrounds compress better than busy ones and result in fewer compression artifacts. If you’re in a location where you can’t change the background, try using a real camera (see Tip 4) and set the aperture wide open (the smallest f-stop number you can, like f2.8) to blur the background. We changed locations for this new Skype call. Notice the background is much less distracting! I’m sure you’ve seen how Skype image quality suffers when the room is too dark. But avoid the temptation to fix this by simply sitting under a bright overhead light. Indirect, white light is far more flattering than yellowish, direct light that makes fierce, hard shadows. Make use of what you have available by placing yourself near a window (face the window, don’t put your back to it!) to let the window filter natural light onto your face. If possible, place a large white piece of paper or foamcore on your desk to reflect light onto the undersides of your face to make sure they aren’t hidden in shadow. (Note if the light coming in the window is so bright it makes you squint, lower a shade to filter out more light or pick another window!) If there’s still not enough light, you can try adding an out-of-the-shot lamp with a sunlight colored (4600 K) bulb. Dave is facing a window, and has a white piece of foamcore over his laptop, reflecting light under his chin, nose and glasses. Notice how much younger and well-rested he looks because the lines on his cheeks and under his eyes are gone. You may think this one is obvious – of course you’ll choose professional-looking clothes before appearing on camera. But did you realize the color or pattern on your clothes can affect the picture quality so much that it can distract the viewer? For example, light coloured or white clothes cause so much light reflection, they can easily look blown out, which is to say no details are visible in them. Also, it’s also important to avoid stripes and small patterns. These are difficult for encoders to properly handle and can cause what is known as moiré interference! 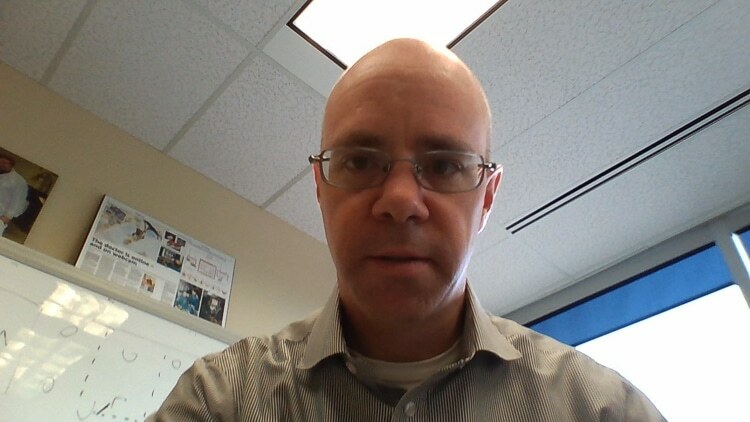 One of the most obvious, but overlooked problems with typical webcams is the distortion and angle caused by using cameras on laptops or mobile devices. The camera is inevitably looking up at you and too close to you, giving the viewer an angle that makes your chin and nose look bigger and your head look longer than it is. Take a look on the web at other Skype interviews! Once you start noticing this bad camera angle, it’s hard to avoid calling it the “up the nose” angle! The angle of laptop cameras also tends to show a lot of the background around you, and even the ceiling above you, which in turn means you to need to control even more of your background to keep it uncluttered for your video session. To get around this, use a dedicated external camera. This can be any camera that has HDMI out and optical zoom, even an old one you have lying around. For example, we used an older model Canon point-and-shoot for our next Skype test. AV.io HD to capture the uncompressed, full motion video and feed it to Skype. Dave’s head is much more proportionate when using a Canon PowerShot SX230 HS and an Epiphan AV.io HD. The camera is positioned across the room and is zoomed in on Dave’s head and shoulders. Notice Dave has also changed his shirt and moved a bit further from the background! Now this looks a professional interview, not just your average Skype call. If you’re going to be doing this kind of interview or remote correspondence often, set up a small studio. Use all the tips above, but add some extra lighting to light your background and control lighting even when you don’t have the benefit of a daylight window. For inspiration, watch this interview Dave did with StudioTech TV using a small Canon digital video camera and AV.io HD for capture into Skype TX. Even the interviewer, Mark, was impressed with the amazing video quality resulting from this combination! While camera auto-adjustments are handy, hunting for focus and constantly adjusting exposure can be very distracting for the viewer. If you’re using an external camera, lock your focus unless you’ll be moving closer/further from the camera during your meeting. Lock the exposure level and aperture too – otherwise even small changes in slide content or sunlight on a wall behind you could cause shifts in the exposure. If you want to go the extra mile, get a neutral white card and set the white-balance for your camera too! Look at how far we’ve come in improving Dave’s Skype appearance. Looking at the final image below, how has your opinion of his credibility changed? If this were a television interview, would you think he was so credible a source that the television show dispatched a real camera operator to his location? Now you can look this professional too! Improve your Skype call presence with our 5 simple steps! Very Helpful information for me. Thank you so much and keep helping the people like me who are looking for a solution.